You know you’re in for an unpredictable ride when the Monk, of all people, shows up on Three’s doorstep. This story made me realise something I hadn’t before about a companion I’ve always liked, so that’s a point in its favour. Namely: during her time on TV, Liz Shaw was stranded, too. Not only had been she dragged away from her work in Cambridge, but also, she didn’t even get the standard perk of being a companion: adventures in time and space! This adventure rectifies that problem, at least briefly, giving Liz an off-Earth adventure. I think the Doctor enjoyed that as much as she did: he misses playing tour guide with an appreciative sidekick. The Blame Game is, of course, a Monk story, which means we have a fruity and unpredictable character stealing the spotlight. Author Ian Atkins is great at writing neglected classic Who characters, capturing their voices and personalities, and weaving them together in interesting ways. Narrator Rufus Hound takes a little while to settle in and find voices for Caroline John and Jon Pertwee. But one soon ceases to notice; the script makes sure they still sound like themselves, even in quotation. More importantly, Rufus Hound is entertaining and convincing as a new incarnation of the Meddling Monk. Yep, that’s definitely him! This story boils down to a metaphorical poker game in which three characters try to outsmart one another. Is the Monk up to something? Is Three, since he’s so desperate to escape his exile on Earth that he might stretch his principles? And what can Liz do in the face of two Time Lords who are so far beyond her that she might as well bring popcorn and watch them argue? 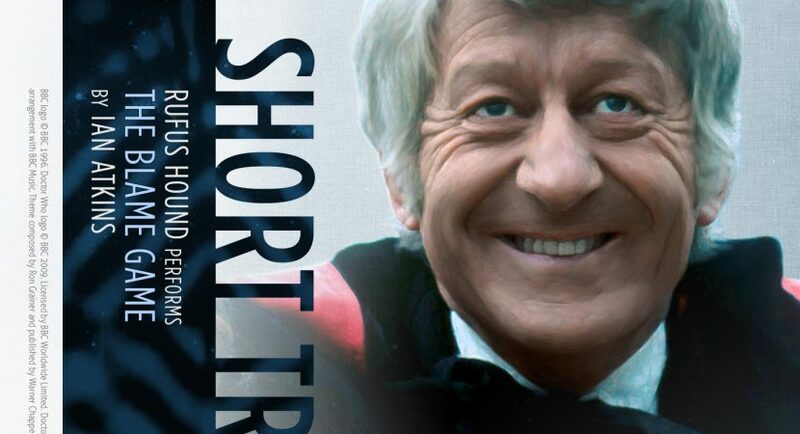 But there’s a surprise in this 40-minute short story that’s so bold and audacious that it impacts all of Doctor Who, almost like a mini-Moffat plot. While I’m still chewing on whether that was one of Atkins’ brilliant ideas or too much to swallow, overall, I enjoyed the plot, the twists, the danger, and really good character beats for everybody. Unsurprisingly, I love the fact that Liz saved the Doctor’s bacon (and that the Monk has a soft side; he’s a very confusing individual). The Monk’s nefarious scheme turns out to be quite topical, since this audio was released a week or so after Pokémon Go. Someone tagged Planet Earth with a “monster lure”! It would explain much, especially if the stuff’s buried in the primordial crust of southeast England. But if all the aliens that attacked/contacted Earth were interested in that buried treasure, you’d think one of them would’ve mentioned it by now.